Hey everyone, I’m sorry I haven’t posted anything in the past three weeks, it’s been a busy month, and then last week my internet said “today I will not work” and went on strike for three days. Today I want to talk about those cheap cuts you don’t want to buy. Give me one good reason you don’t want to use them? There is so much hidden gold in “rib” cuts and “stew” cuts. Generally, the cheap cuts are the ones that need braising for three or four hours. Time + Love + Cheap cut = Tender yumminess in your mouth. Don’t forget that! Braising meat can take time and I understand that. I was always told that as simple as something like a braise is, it’s easy to mess up. I honestly feel it’s the truth, I’ve tasted a few braises that were just bland and didn’t have flavor. So pay attention to how you are braising your meat - you have to check on it, make sure it hasn’t overcooked, have patience, know when it’s perfect. 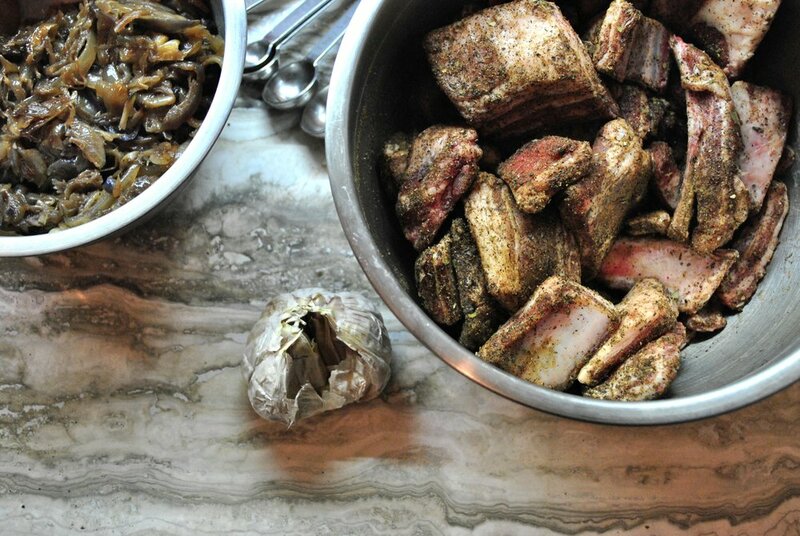 All of these are things you have to repeat in your head when you’re doing a braise. I had two pounds of lamb that were cut into small pieces. I didn’t want to put them in the oven, they weren’t big enough nor did I have enough meat to do a proper braise. So I cheated and pressure cooked my meat instead. I marinated the meat a day before with the Baharat Spice mix. After marinating for 24 hours I put my pressure cooker on a high heat, poured some oil inside, so I could get a good sear on the lamb. Once It was finished searing I added some salt, Rosemary, Roasted Garlic then just enough water to cover the meat. Then I put the lid on so it could start to pressure cook. Do not remove the lid or release the pressure. You want it to cook for 30 minutes. Now, when thirty minutes is up, make sure your sink is clear. You are going to put the pot in the sink (with the lid still on) under your pipe and turn the cold water on to let it run over the pot. This cools the pot and helps to equalize the pressure on the inside with that of the outside. Usually there Is a knob or button that indicates when there is pressure. Once it falls and shows there is not more pressure, just wait another minute. It’s better to be safe than sorry as pressure cookers can be very dangerous. Now you’ve got really tender lamb without having it in the oven for four hours. Separate the liquid from the lamb into a pot and leave to reduce on a medium heat. Reserve the lamb and keep warm, maybe at a very low temperature in the oven (150°F). Once your sauce is reduced, taste it, season it. You don’t need to strain your sauce. I strained mine so it could look perfect for the pictures (unless you’re running a restaurant or doing a blog post, I wouldn’t get too worried). Keep the sauce warm on the stove. If you love Couscous and Mediterranean grains, then cook up your favorite and serve it with this lovely spiced Lamb dish. I thinly sliced some radishes and kumquats. Pick some coriander leaves and oregano leaves for plating garnish. There were some baby carrots that I sliced and gave a quick saute. In the end, what I plated was for pictures and a bit more of plating practice. Try this for fun, taking special care when plating is visually appealing to whomever will be eating your dish. Have a great week everyone, keep cooking. Food is life!